BOSTON—Calling it a minor setback for what otherwise appeared to be a promising new medical intervention, a team of infant researchers announced Wednesday that their experimental anti-aging treatment still has a few kinks. 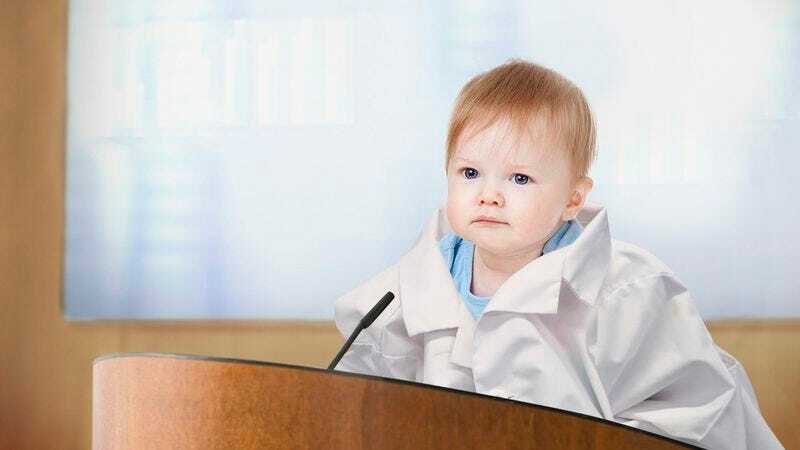 “Though broadly successful across several different metrics, there were a few unforeseen, but relatively minor, complications in our initial trials that we are currently working to address,” said lead researcher Dr. Leonard Rothman, spittle dribbling down his pudgy cheek as he struggled to peek his little, bald head above the podium. “We have achieved tremendous results over the course of our tests, and although we’ve run into a few hitches along the way, we are confident that this will be a viable treatment.” Dr. Rothman added that his team very much looked forward to completing their work when their bodies were once again developed enough to operate lab equipment.